From the very first page, we know who the killer is; we know that he’ll be captured, found guilty and sentenced to prison; but we don’t know who his victim is. Georges Simenon’s novel Acts of Passion takes the form of a long letter, written by a killer to the judge who sentenced him. The killer wants to explain why he did what he did; he wants someone to understand his actions, to see him as reasonable in spite of it all. The judge knows who he killed, of course, so there’s no reason for him to mention the murder until he has to. This is what gives Act of Passion its narrative tension, a tension the reader feels almost at once. The killer begins with the first days of his marriage. Did he kill his wife? It seems like a good marriage, though there are hints of trouble to come. A mother-in-law who is around much too often. Does he kill her? After several years together, the killer takes a much younger mistress. Will she be his victim? He manages to introduce the young woman to his wife and to convince his wife that she is alone in the world and in need of help. His wife agrees to let the girl live in their spare bedroom. This certainly can’t end well. In his introduction Roger Ebert explains that Simenon deliberately wrote without style; that whenever he encountered a particularly literary turn of phrase in his writing, Simenon edited it out. The result is some of the most spare writing you’ll find, even in a crime novel. 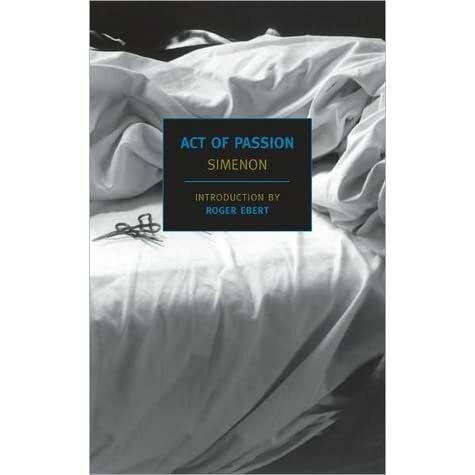 I imagine that while writing Acts of Passion whenever Simenon came across a passage that built up suspense he took it away as well. He never tries to make this novel a page turner. His killer is not hiding the truth from the reader just to keep the reader reading. He’s telling his story to the judge, trying to explain his actions, not to justify them but to make them understandable. He’s not trying to tell a suspenseful yarn. But he does. Acts of Passion has obvious links to Dostoevsky’s Crime and Punishment. Both deal with a man who comes to kill and is then haunted by the act. If you were to say that Simenon is not in Dostoevsky’s league, I would agree of course, but I think you may be structuring the comparison incorrectly. It’s not that he’s in a different league, it’s that he’s playing a different game in the first place. Dostoevsky’s wonderful novel is concerned with higher philosophical issues. The crime in Simenon’s novel is based on passion alone. The killer cannot bring the judge or the reader to understand his actions in the end because we have not shared his passion. Dostoevsky’s hero becomes mad as his story progresses. Simenon’s killer is mad from the outset. That he seeks understanding is a sign of his own madness. He’s similar to the narrator of Edgar Allen Poe’s “Tell-Tale Heart” who keeps insisting he is not mad right up until the end. All of this makes Act of Passion an anti-thriller thriller. Without using any of the typical tropes one finds in thrillers, without overtly forcing suspense on the narrative, Simenon keeps the reader turning pages caught up in the story in spite of it all. This review first ran on my old blog Ready When You Are, C.B. In the following years I’ve continued to read and enjoy George Simenon. Fortunately for me, and for the rest of her fans, he wrote hundreds of books. It will take a lifetime to read them all. Having read so many of his works, would you have a favourite to recommend to a first time reader? I would start with one of the Maigret novels. You can pick just about any one of them. They are all good for a read-in-a-single-long-afternoon kind of way. The non-Maigret novels are good too, but typically much darker overall. If you like your noir on the dark side, you might try one of those. I think dark would suit me best……. I’ve been revisiting some of the Maigret novels after a gap of many years, and thoroughly enjoying Simenon’s style. I’ve been thinking about trying one of the non-Maigret books – this one sounds fascinating. One for the wishlist, I think!